Ultimate Access E Electric Projection Screen :: Draper, Inc. 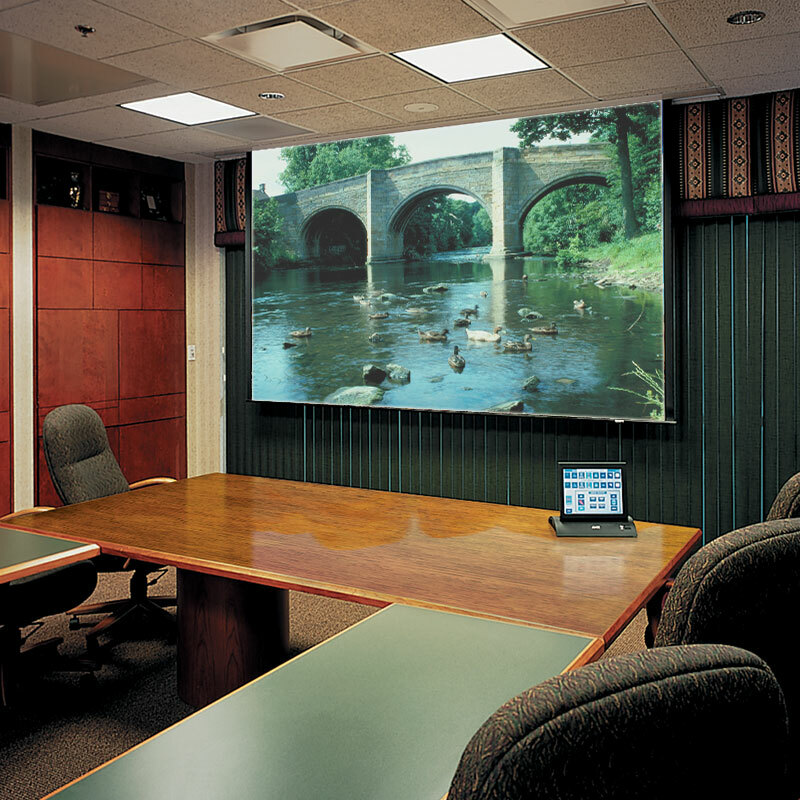 Complete concealment and smooth clean design makes the free-hanging, ceiling-recessed Ultimate Access E electric projection screen ideal for boardrooms, mid-sized training rooms, universities, or home theaters. During use, a second motor opens the lower panel upward into the case to allow the screen to descend into the room. 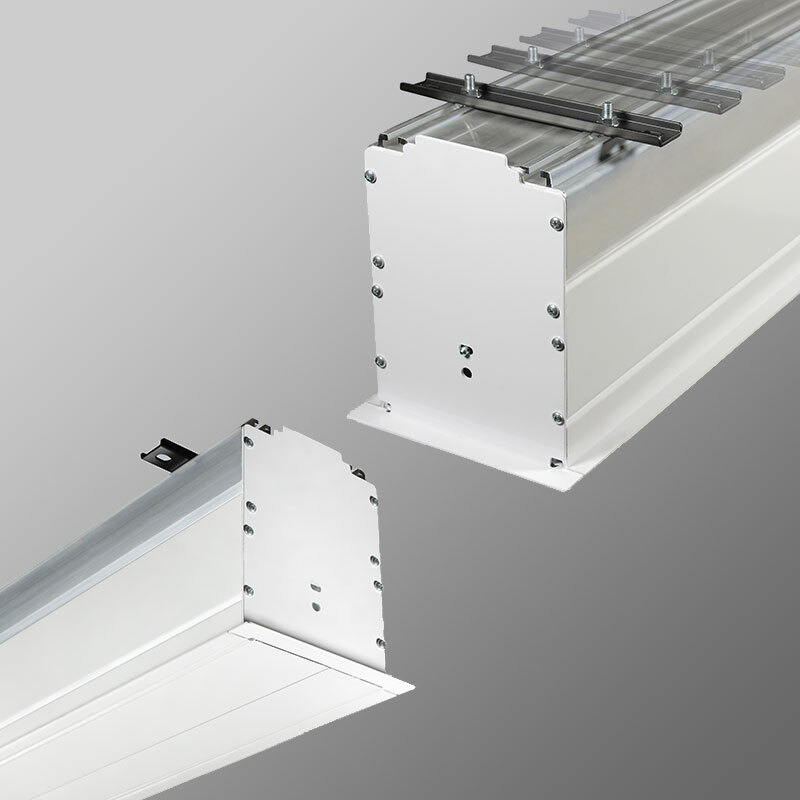 Retracted, the projection screen completely conceals behind a smooth, lower panel in the ceiling with no exposed screw heads or fasteners. This free-hanging, fiberglass-backed projection screen maintains flatness thanks to the weight of the screen and bottom dowel. Installation of the case during the initial phase of construction eliminates job site damage, allowing for installation of the screen at a later time. Case dimensions are 9-7/8" high x 8" deep (25 cm x 20 cm), includes trim flange. Built-in controls may increase case length. Mounting brackets may add to case dimensions, see Submittal in the Technical Documents tab for details. Maximum image width up to 12' (366 cm) wide, depending on surface selection. NTSC, HDTV AND 16:10 format have image area framed with black on all fours sides. Black side borders are available on request for AV format Screens. Sliding brackets on top of the case allow for adjustments when mounting. Sliding brackets inside case accommodate different size screens. Fully automatic ceiling closure panel provides complete screen concealment. Can be finished by contractor to match ceiling. Independently motorized ceiling closure opens into the case. Quick-connect wiring allows for early installation of the case with the addition of the screen later. Includes a 110V three-position switch (standard). Quiet, low voltage motors and 220V options are available. Image/Viewable area: 50" x 80"
Overall size: 62" x 83 1/2"